Palace, fortress, prison…tourist attraction. The Tower of London, with its rich and bloody history, is one of the most intriguing landmarks in London. Dating back to William the Conqueror and built in 1078, the Tower has figured largely in the city’s history. Probably best known as the site where Anne Boleyn parted company with her head, it was also the temporary “home” of Queen (then Princess) Elizabeth I when she was imprisoned by her sister, Queen Mary I. The list of names of those imprisoned in the Tower at one time or another is lengthy indeed—dating to as recently as World War II. It is one of the most popular tourist spots in London and houses the crown jewels. It is operated by an independent charity called Historic Royal Palaces and is not funded by the Government or the Royal Family. Tours are given by Yeoman Warders—better known as “Beefeaters”—who live onsite with their families. These tours are informative as well as entertaining. The Tower is a huge facility, so it is best to arrive early in the day and beat the crowd; there is much to see. The crown jewels are housed in the Waterloo Barracks and the line tends to be very long, so either plan to arrive when the Tower opens and see the jewels before embarking on a Beefeater tour, or brace yourself and get ready to wait awhile. 888,246 ceramic red poppies have been installed in the moat to commemorate the centennial of the beginning of World War I. The memorial is entitled, “Blood Swept Lands and Seas of Red,” with each flower representing a British or Colonial serviceman who was killed in the War. It is a striking sight and quite impactful. We had a couple of hours to spend at the Tower, which was barely enough time to scratch the surface. I hope to go back and explore the site more thoroughly in the near future. Hospital and retirement home for war veterans, museum of weaponry and military history, final resting place of Napoleon Bonaparte. Les Invalides is a sprawling complex in the 7th arrondissement of Paris that faces Esplande des Invalides and the gilded Pont Alexandre III (Bridge of Golden Statues). It is an imposing, beautifully symmetrical structure that was commissioned by Louis XIV in 1670. Everything about Les Invalides is impressive—from Bruant’s arched pediment on the north side of the building to Mansart’s gilded dome on the south side. Its military museums contain artifacts dating from the Middle Ages through the Second World War—uniforms, maps, flags, scale models, weapons, armor, and such. By far the most interesting thing to me was the Royal Chapel (Eglise duDôme des Invalides) where Napoleon is entombed. His mammoth sarcophagus contains a nest of six coffins and stands directly under a dome emblazoned with De La Fosse’s allegories. I was interested to learn that Napoleon actually visited wounded soldiers at Les Invalides during his time in Paris. Outside the domed chapel is a lovely sculptured garden (Jardin de l’Intendant) with a fountain, flowers, and neatly trimmed hedges. Anyone interested in carefully perusing the Army Museum should allow several hours for a visit; we saw everything of interest to us in about an hour and a half. 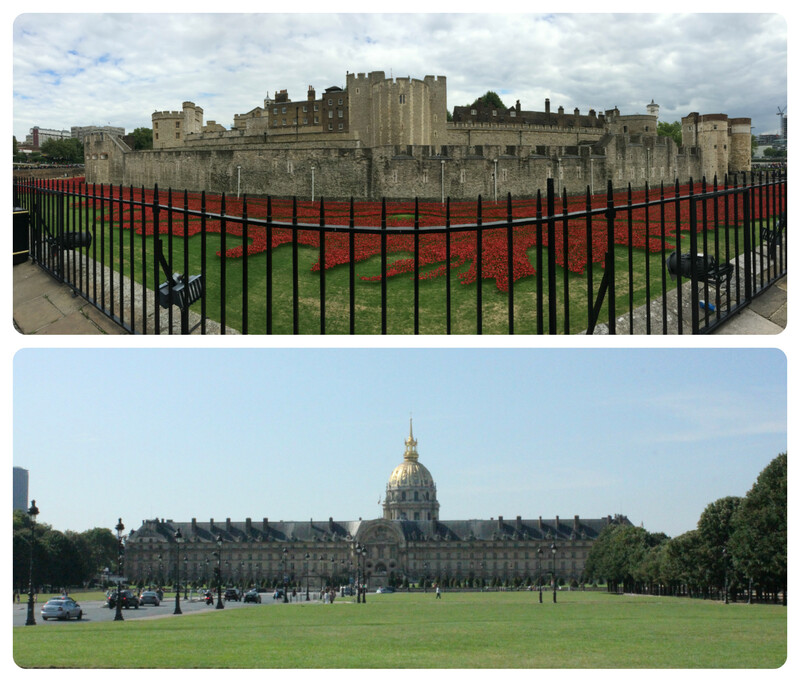 Incidentally, we used our Museum Pass and walked right into Les Invalides for a self-guided tour. Soooo… Paris-2, London-2. As you can see, it is no easy task to choose a favorite between these two cities. Each has its own unique personality and much to offer. Personally, I love them both and hope to have more time to devote to each! Strolling along the banks of the Seine was one of my favorite experiences while in Paris. The pedestrian walkways (quays) are fantastic and were surprisingly uncrowded—especially for summertime. We easily transitioned from river level to street level (and back again) via staircases attached to the many bridges spanning the Seine. There were a number of interesting activities and exhibits along the river including an outdoor art expo entitled Les Stars et La Seine, which showcased rare photos from the archives of Paris Match magazine. Among the famous personalities included in the black-and-white collection are Frank Sinatra, Paul Newman and Joanne Woodward, Rudolf Noureev, Natalie Wood, Alain Delon and Romy Schneider—all photographed in close proximity to the Seine. Another attraction along the famous waterway is “Paris Beach,” a half-mile stretch that is converted into a makeshift beach during the months of July and August. Sand is hauled in and put in place—around 5,000 tons of it—accompanied by chaise lounges, umbrellas, live music, and sidewalk cafes. Though there is no ocean to swim in, Parisians and tourists alike can bask in the sun and watch the river drift by. I was expecting a lot more boat traffic on the Seine; there was actually very little, which adds to an overall sense of tranquility. Several companies offer riverboat cruises on the Seine; we chose the evening “illumination” cruise that begins at dusk. We traveled upriver as far as Île de la Cité before turning around, at which point the sun was setting and the buildings along the Seine were beautifully lit. It was THE highlight of our time in Paris—primarily because the tour concluded in front of the Eiffel Tower, which was blazing in all of its nighttime splendor. Add to that, the spectacular “twinkling” light show for five minutes at the top of the hour. It was truly a memorable experience! Mention of the Thames River evokes instant mental images of Queen Elizabeth I regally setting forth from Whitehall aboard her royal barge, gliding down the river, and imperiously disembarking at The Tower. (I confess…I am a history buff and an avid reader of historical fiction.) Though we didn’t bump into the queen (past or present), we did acquaint ourselves with the river to some degree by walking along the South Bank. It was quite crowded, however, and detracted from our enjoyment of the river itself. The views from the Millenium Bridge and the Golden Jubliee Bridges were great and offered nice panoramic photo opportunities. 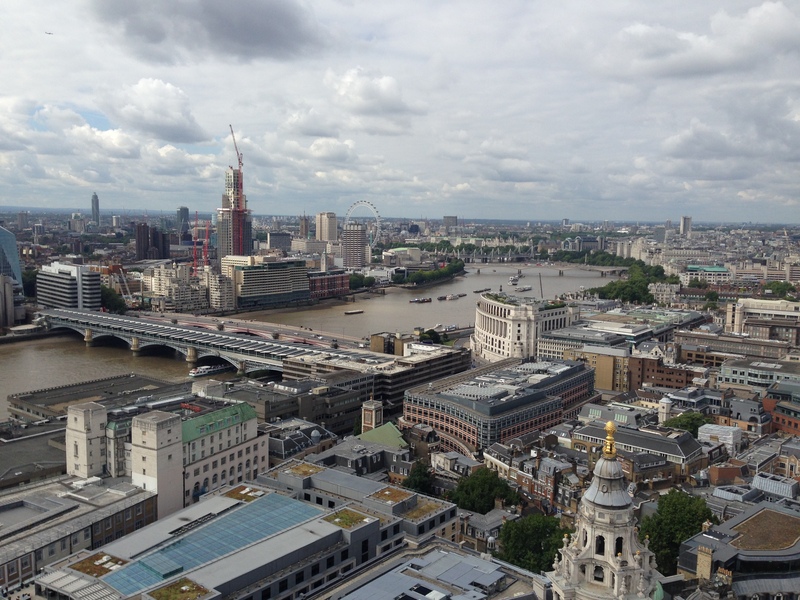 There was also a decent view from The Tower—although more interesting than the view of the Thames from there was the view of Tower Bridge. 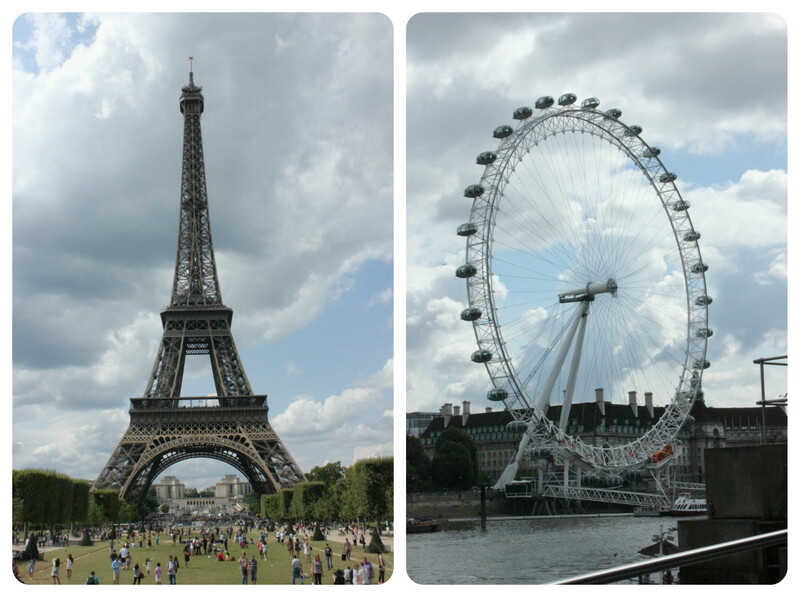 We took a riverboat cruise from the London Eye to the Tower, but were not terribly impressed with the experience. While the narration was interesting and entertaining, we were trapped at a table at dead center inside the boat and could see almost nothing. Add to that the fact that the concession stand was out of basically all snacks and drinks, and it was a less-than-stellar experience. There was a fair amount of boat traffic which steadily increased as we approached The Tower. The Thames, with its imposing size and rich history, is impressive for sure…but it lacks the “personal” feel of the Seine. If, like me, you watched with wonder the fairy tale wedding of Prince Charles to Lady Diana Spencer all those years ago, you will want to visit the actual site of that notorious event—London’s St. Paul’s Cathedral. (Even if you didn’t watch the wedding, you will want to plan a visit!) The magnificent 66,000-ton dome, designed and constructed by Christopher Wren in the late 1600’s, soars above the city at a height of 366 feet. The cathedral’s interior boasts ceiling mosaics (commissioned by Queen Victoria), an ornate canopied altar, and a number of monuments. The crypt, located in the bowels of the building, is the final resting place for some of Britain’s most notable heroes, including the Duke of Wellington and Admiral Horatio Nelson. It also houses a nice gift shop and a small cafe, where we paused for a quick lunch. The highlight of any visit to St. Paul’s (in my opinion) is the climb to the lantern situated atop the dome. From ground level, there are 560 steps which pass through three galleries. The first is the Whispering Gallery, famous for its acoustics…two people can stand on opposite sides of the dome, whisper something against the wall, and be heard by one another. It is not quite as simple as it sounds, but with persistence—and a little guidance from the employees stationed around the gallery—you can do it. Next, is the Stone Gallery, an open-air space 174 feet up that affords wonderful panoramic views of the city. The stairs end at the Golden Gallery, a narrow perch encircling the base of the lantern 279 feet up. The view from there is quite incredible. For more information or to plan your visit to St. Paul’s, go to https://www.stpauls.co.uk/visits/visits. My only complaint, if you will, with my visit was the regulation against photography inside the cathedral. That is always a disappointment. Notre Dame was at the top of my sightseeing list while in Paris but, due to time limitations and its location, we were unable to actually go inside. Unlike most of the famous landmarks in Paris, Notre Dame does not accept the Museum Pass and, thus, no one is allowed to by-pass the line. We had walked from Les Invalides, stopping at various landmarks along the way, and arrived at Notre Dame around 5 o’clock. The line was wrapped completely around the square (Place du Parvis) and the wait to enter was going to be several hours. With precious little time remaining before flying to Ireland, we opted to admire the iconic church from outside and hope to return and go inside another time. We were fortunate enough to hear the bells chime while we were there, so that was a small consolation of sorts. The exterior facade of the church is quite amazing. The rose window, Kings of Judah, gargoyle waterspouts, and flying buttresses are exquisite and worthy of close examination. (The history behind these architectural features—especially the twenty-eight Kings of Judah—is intriguing and worth researching before your visit.) I have been kicking myself since realizing that I completely forgot to look for Point Zero—the center of France—near the front entrance of the church. I’m sure I walked right past it, but my attention was on the crowd rather than focused on the ground. While I would have loved to see the cathedral’s interior and make the 400-step tower climb, the view from the outside was impressive and will have to hold me over until my next visit to Paris. 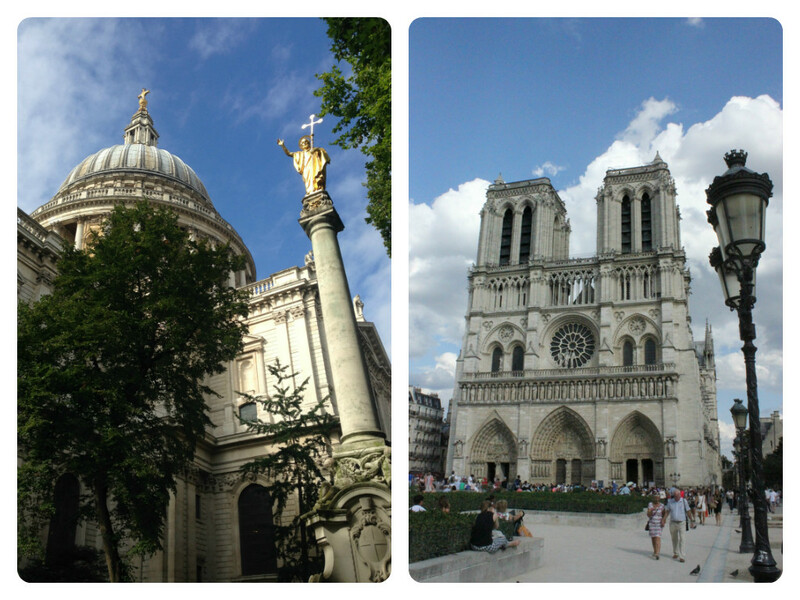 For information on touring Notre Dame, go to http://www.notredamedeparis.fr/spip.php?rubrique70. My pick: St. Paul’s Cathedral… This choice may seem skewed since I didn’t actually go inside Notre Dame, but I am sticking with St. Paul’s unless and until a return visit to Paris changes my mind. I am partial to domes, however.